With Jewelweed this beloved author returns to the same out-of-the-way community and introduces a cast of characters who must overcome the burdens left by the past. After serving time for a dubious conviction, Blake Bookchester is paroled. As Blake attempts to adjust, he reconnects with Danielle Workhouse, a single mother whose son, Ivan, explores the woods with his precocious friend, August. While Danielle goes to work for Buck and Amy Roebuck in their mansion, Ivan and August befriend Lester Mortal, a recluse who lives in a melon field; a wild boy; and a bat, Milton. These characters — each flawed, deeply human, and ultimately universal — approach the future with a combination of hope and trepidation. Jewelweed offers a vision in which the ordinary becomes mythical, the seemingly mundane transformed into revelatory beauty. I got Jewelweed from ALA Midwinter and wasn’t sure what to expect since it is a very different style from what I usually read. The wondrously crafted writing drew me in immediately. David Rhodes is such a phenomenal writer that he creates scenes that could easily be boring and commonplace and turns them into revelatory and pensive reflections on life and society. 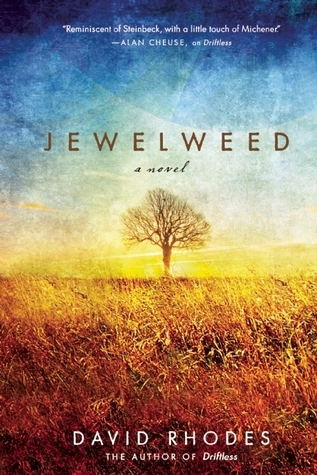 The multitude of themes and interwoven character lines made Jewelweed a pleasure to read. Jewelweed is a magical book, and there is so much more to it than it seems originally. There are layers upon layers of complexity to it, switching from narrative to reflection and back again effortlessly. I loved how this book acknowledged the darkness in the world and didn’t shy away from it, but showed the hopefulness of the human spirit underneath all types of suffering that are experienced in a community. It is hard to put into words just how much I loved this book. Don’t get me wrong, I love a good Young Adult Urban Fantasy adventure as much as the next bookworm, but there is something so rich about this book, I feel that I could read it ten more times and notice something new. It reminds me of the type of story that will be read and discussed in schools fifty years from now. Suffice to say I cannot recommend this book enough. Though for the most part plot-wise there isn’t anything that younger readers couldn’t handle - I’ve read Young Adult books that were much higher on the rating scale – the amount of subtlety in the book probably wouldn’t be easily grasped by anyone younger than high school. I am excited to see how this book is received and if other people will be as moved by it as I was!